Products Liability Attorney | New York & New Jersey | Law Offices of Adam M. Thompson, P.C. As a consumer, you rely on designers, manufacturers, and retailers to produce and sell safe products. Most of the time, the products you use on a daily basis are safe for you and your family. What happens, however, if a product isn't safe, resulting in injuries to you or a loved one? Unfortunately, this happens more often than it should throughout the United States. When a defective product makes it to a consumer, and the consumer is injured, the injured victim may be entitled to compensation through a product liability lawsuit. At the Law Offices of Adam M. Thompson, P.C. we represent consumers who have been injured because of a defective product. If you or a loved one has been hurt by an unsafe product, you need an aggressive attorney to be your voice in the legal system. You need seasoned New York City product liability attorney Adam Thompson by your side to ensure that you are fully and fairly compensated for the injuries caused by the defendant's defective product. Contact the Law Offices of Adam M. Thompson, P.C. by calling 855-497-2326 or by filling out our online contact form for your free consultation. We proudly serve clients in New York State and New Jersey, and our phones are answered 24 hours a day to ensure that you can reach us when you need us. Design defect – a design defect is one that is inherent in the design itself. For this reason, when a design defect is present it is typically found in all the products manufactured with that design. A brake pad whose design calls for materials to be used that fail to perform well in sub-zero temperatures, for example, illustrates a design defect. In that case, all of the brake pads produced using that design will fail at sub-zero temperatures. Manufacturing defect – a manufacturing defect is a defect that is introduced during the manufacturing phase of a product. As such, only a fraction of the products produced will have the defect. In the brake pad example, assume that the design called for materials that will withstand sub-zero temperatures; however, at one of the manufacturing plants the wrong material was used one day while fabricating the brake pads. That material used on that day cannot withstand sub-zero temperatures, causing the pads to fail. In that case, only the brake pads made that day at that plant will be defective. Failure to warn – for products that cannot be made safe because of the nature of the product itself, adequate warnings are required. When those warnings are missing, the product is defective. Household cleaners, for example, often contain caustic chemicals needed for the products to carry out their intended function. Those chemicals make the cleaner inherently dangerous, requiring the product to contain an adequate warning alerting consumers to the danger. 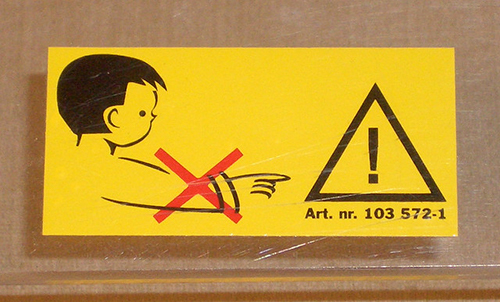 If an adequate warning is absent, the product may be defective. If you have been injured by what you believe to be a defective product you need an experienced product liability attorney on your side to ensure that you are compensated for your injuries. At the Law Offices of Adam M. Thompson, P.C. we represent consumers throughout New York and New Jersey who have been injured by defective products. We will zealously pursue your right to compensation and make sure the at-fault parties are held accountable. Contact the Law Offices of Adam M. Thompson, P.C. by calling 855-497-2326 or by filling out our online contact form for your free consultation.